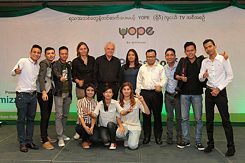 YOPE was launched as Myanmar’s first youth magazine in July 2016. It has since then ceased to be a media experiment and established itself as a firm voice for young people. Approaching its first anniversary, the Goethe-Institut - as a partner and supporter from the very beginning – reflects on the successes and challenges of the founding period. YOPE stayed true to its own independent voice which we helped to raise through regular workshops and trainings. The origin of YOPE underlines its hope for an unbiased character. Bringing in the best from a collaboration between the media house Mizzima and the Goethe-Institut, it was destined to combine topics of interest of Myanmar’s youth with an international level of journalism. Human capacity cannot be measured in numbers. The result of YOPE’s evolution, however, has clear indicators. Since their first upload, their Facebook page counts 361 entries, among them more than 160 episodes produced since its launch. They generated a total of more than 415.000 interactions with their viewers and engaged with them through social media. Every day, their content reaches an equivalent of 180.000 users. And in addition to the thousand who leave a Thumbs Up under ever new video-upload, more than one million viewers have given their positive feedback since its launch one year ago. YOPE-Team and Initiators at the Magazin Launch | YOPE Four trainers from Cape Town, Germany and Malaysia started the first workshops in March 2016. The project is managed by Ute Mattigkeit and supported by Richard Bade, Dominique Vandenhoudt and Fatima Abdul Kareem in its ongoing workshops. Capacity building in the media sector has a long tradition in similar programs of the Goethe-Institut in the region. Over the years, what started as workshops grew into a self-reliant network of well-trained local media contributors. Knowledge from the region helps to build the talents of the future. Fatima Abdul Kareem, once a participant of a related Goethe project in Bangkok, now trains the young media developers of YOPE. With her support, the program manages to be an economically sustainable exchange within regional boundaries. Ownership of the program is crucial. Therefore, the first question had to be: What kind of program do you, the participants, want to produce? Everything, starting by the title was voted on by them: YOPE as an abbreviation for Young People. The concept had to provide the contributors with enough flexibility to expand and stir it into new directions with every new workshop. One workshop followed every two or three months and participants now increasingly make their need for the return of the trainer felt. YOPE listens: Talk in the Streets | YOPE In the initial trainings and street interviews, the new approach of YOPE already gave a glance of what was to follow. Within the format Vox Pop (or Vox Populi – interviews with the public) they started raising unconventional, for some even provocative questions. “Would you kiss a boy who chews betel nut?” The resulting video, published on the same evening, was set to reach more than 2 million views overnight. An early success that boosted the motivation of the participants. With growing experience and confidence in their work, the group took on more daring, investigative topics. Is Yangon a safe place for young girls? Whose task - if not of the young generation itself - would it be to voice such questions? A camera crew following the female YOPE presenter on her walk home during the night documented how young women are forced to walk in dark streets with no policemen around and having strangers following them. This production proved more than another hit in outreach, as it got more and more Burmese media questioning the issue of women’s security in urban Yangon. Looking back now, hardships cannot be ignored. YOPE’s start surpassed any prospects, and was responsible for setting even higher expectations. The best performing stories aired in July and August, and so left a relative vacuum for the following months. The struggle for attention among Myanmar’s youth continues, even as YOPE has repeatedly proved its good judgement. Mikis YOPE One particular occasion stands out: End of September last year, the popularity of YOPE, now at 330.000 facebook-followers, skyrocketed with an acquisition of ten thousand new followers on one day. More than fifty thousand users responded, liked and shared the YOPE profile of Mikis Weber, a popular Hip-Hop musician with German roots who gave a colourful insight into his daily routine - all in fluent Burmese. The episode did not only propel YOPE forward, as Mikis has since then occupied all major stages in Yangon. An example of just how much of a voice for the youth YOPE has become. It has not only developed a fine sense for what young people are interested in, but also makes an impact on the choices and activities of young viewers. The initial ten participants of YOPE are an attractive target on the market for media talent. "It is just that they recognize that they are able to do things and so there is a demand for them. So they try it out," their trainer Fatima acknowledges. Four of the original youth journalists now constitute the core of YOPE and new voices fill in the place of the old team. Especially with the four remaining, increase in quality is palpable. In a project with no fixed duration, investment in human capacity continues to leave a mark. YOPE's self reflection: Brave Voice | YOPE Brave Voice Cultural differences between the demanding and outspoken trainers clashed with the Burmese culture where, at least it was felt by some trainers, one is not taught to be open and honest at all times. Giving them the confidence and the early proves of a market for their idea had a lasting effect. Creating a personal bond with the participants was essential. The times when the organizers had to push for additional workshops are over. Nowadays, participants are demanding their trainer Fatima to come back, listen to them and their ideas and be challenged in their future productions. Fatima’s moral “You have social obligations to your society, your content has to be meaningful!” certainly caught a nerve with the participants. Together, new topics, storylines, angles and figures are brainstormed and discussed. The real work then follows between the workshops. At the next workshop, the trainer and her students assess and analyze the produced content. YOPE will have its own slot in the TV channel that Mizzima is to launch in early 2018. Fifteen minutes of YOPE’s content will be shown in prime time on the weekend each week. That makes special briefings on TV production the question of the hour for a format until now exclusively produced for Facebook.